In 2006 Christophe Vaillant formed the 60s beat music group Pony Taylor in Avignon, France. Then in November 2014 he began work on a solo album by singing all parts and playing all instruments. Once he felt ready to produce the album he recruited his brother Olivier to play drums and his friend Pandora for vocals. Le SuperHomard was born. For those of you who don’t know, "homard" is French for lobster. Their debut album Maple Key is set for release on March 26, 2016. Maple Key consists of eight electronic pop songs, four on each side of the disc. The tracks are also evenly split between instrumentals and songs. 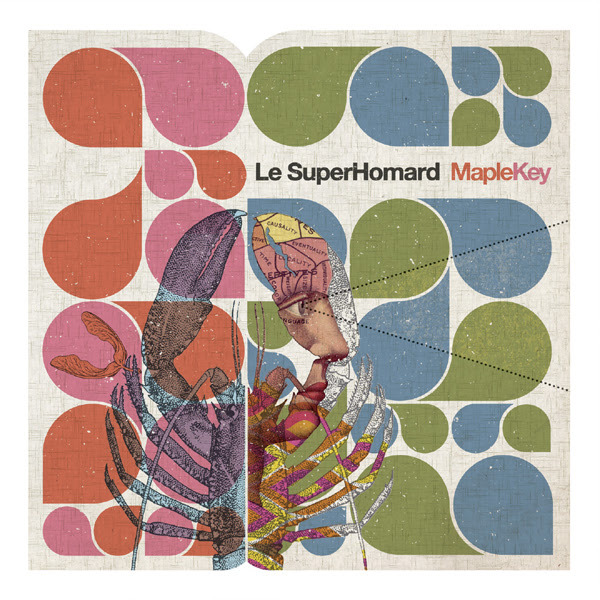 Le SuperHomard’s electronic pop is not dance music or techno, it is gentle, easy listening music with French pop references. Some of the songs have a moody dreamy ambience with Pandora’s exquisite vocal harmonies (“Maple Key” and “On a Sofa”). The New Wave band The Young Marble Giants can also be thought of as a point of reference, especially on “Dry Salt in Our Hair.” If you yearn for French electro-pop, be sure to snag one of the 250 copies on white vinyl. Maple Key may just satisfy your craving.